Uzbekistan, a small country nestled in between Kazhakhstan and Turkmenistan and housing half the Aral Sea, is the second largest exporter of cotton in the world. But while this small country is at the forefront of global cotton production, selling over 800,000 tons of cotton every year, its track record regarding human rights is far behind. President Ismam Karimov’s regime uses torture and oppression to control laborers, while simultaneously bringing about one of the worst human-produced environmental catastrophes of the last 50 years—the draining of the Aral Sea. The people of Karakalpakstan who once relied upon the Sea for livelihoods now suffer from high rates of unemployment and severe health problems caused by their degraded environment. The Environmental Justice Foundation (EJF) is dedicated to creating, implementing and building solutions where they are needed most, including Uzbekistan. After much research, EFJ released White Gold—The True Cost of Cotton a campaign report with accompanying video footage. Kymberlie Adams Matthews had a chance to talk to Juliette Williams, Founding Director of the Environmental Justice Foundation about the fabric of our lives. Can you tell us a bit about the Environmental Justice Foundation? The Environmental Justice Foundation (EJF), a UK-based nonprofit, believes environmental security is a human right. For millions of people around the world, the result of a degraded environment is hunger, brutal poverty and increased vulnerability. When we established EJF we had a clear goal in mind—to partner with activists and help them gather powerful video and photographic evidence of environmental and human rights abuses that can be presented to audiences around the globe. In short, we work to give a voice to communities who witness their lives and livelihoods ruined by Western consumer demand be it for cheap farmed shrimp, illegally caught fish or the latest cotton fashions. President Karimov’s control over Uzbekistan is founded upon his monopoly of Uzbekistan’s exports of cotton. How much does the Karimov regime earn from cotton exports? One cotton farmer described his situation as if “hanging between life and death,” explaining, “The government controls our lives very tightly. If we don’t obey, we’ll end up in trouble. All we want is freedom, and the state is punishing us for wanting freedom.” Can you talk about the government and its systematic use of torture and oppression to enforce cotton production? In a scenario reminiscent of Soviet times, the Uzbek government has a total monopoly over cotton production and sale. The government sets production quotas, which farmers must meet; all wages are administered via corrupt state banks; agricultural inputs such as pesticides are prescribed by the state; and the scarcity of internal movement visas severely restricts people’s ability to avoid the system or seek an alternative livelihood. Those who complain are liable to be arrested and beaten by local governors or henchmen directly appointed by President Karimov. In order to meet the quotas, Uzbek cotton production has become characterized by blatant human rights violations. In order to bolster the workforce, the Karimov regime conscripts tens of thousands of Uzbek children, to serve as manual cotton harvesters. The regime has such a tight grip over the country it is virtually impossible for objectors to have their voices heard. One human rights activist whom EJF met with two years ago was arrested on spurious charges and has been incarcerated for over a year now, with no contact to the outside world. The government silences its critics. The massacre against peaceful demonstrators in Andijan in May 2005 provided a real snapshot of the systematic violation of human rights—there is no democracy, torture and arbitrary arrest are widespread, and the media and non-governmental organizations are severely restrained. Uzbekistan is a pariah state, yet we in the West continue to trade with the government, supporting the oppression of the Uzbek people every time we buy a garment made from Uzbek cotton. Do you consider the people of Uzbekistan, the cotton workers, to be victims of slave labor? For many this forced labor is akin to slave labor as the rural population really has no choice but to participate in cotton production. The enlistment of people into the fields doesn’t just involve cotton farmers, but public workers including teachers and hospital staff. Hospitals and schools close for weeks at a time. However, our contacts in Uzbekistan are keen on not being viewed as slaves as this demoralizes them even further and serves as a reminder of their subjugation. For this reason we refer to this as forced work, rather than slave labor. 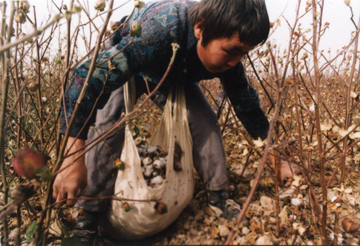 The majority of Uzbek cotton is gathered by hand and mostly by schoolchildren. Can you discuss this as well as what happens to children who fail to meet their quotas? The government’s desire to maximize profits has resulted in the annual conscription of Uzbek children—some as young as seven—as cheap or free labor during the cotton harvest. The ‘luckiest’ amongst them can earn two cents for every pound of cotton they pick. Some can miss up to three or four months of education as schools and colleges are closed. Cotton picking is really arduous work and EJF witnessed hundreds of children in the fields, picking cotton for hours each day. The harvest begins in the latter part of the summer when it is extremely hot, and continues through Uzbekistan’s autumn, when weather conditions can be appalling. These children are out in the fields wearing no protective clothing, just slippers or sandals on their feet and carrying these heavy bags of cotton on their backs. Approximately how many children are we talking about? It is impossible to know the precise numbers of children forced into the fields to work, as the Uzbek government denies that child labor occurs. On the basis of media reports and our own investigations, I would say that tens of thousands of children are involved during the annual harvest. In October 2004, a minister admitted that at least 44,000 pupils and students were harvesting the cotton, but these figures must be far short of the reality as three years previously, 198,055 school children were reported working in the Ferghana region alone. The Aral Sea, once the world’s fourth largest body of inland water, has now shrunk to just 15 percent of its former volume. How did this happen? How does it affect the people? Cotton is the world’s thirstiest crop—six pints of water are needed to produce one cotton bud. In Uzbekistan almost 20,000 pints are withdrawn for every pound of cotton harvested. This demand for water is causing a crisis for rivers in cotton-growing regions around the world. In Central Asia, the Aral Sea is fed and was sustained by the Amu Darya and Syr Darya rivers, which together carried more water than the Nile. But since Soviet times, water from the rivers has been diverted for irrigation mainly for cotton fields, and very little water now reaches the Aral. Today, around five cubic miles of water is diverted from these rivers every year, and much of this is lost en route to the fields, through Uzbekistan’s crumbling canals and irrigation pipes. Can you discuss the health problems associated with pesticides used in the production of cotton? What percentage of the community suffers from affiliated diseases? And with special regard to the Karakalpak communities? Almost two pounds of hazardous pesticides is applied for every three acres of cotton and thousands of people working and living in cotton-growing areas are poisoned each year. Aldicarb—used widely in cotton production—is so toxic a teaspoonful on the skin would kill an adult. The Karakalpak have suffered the brunt of the environmental crisis, not only through the loss of their livelihoods—unemployment stands at 70 percent—but also because of the health problems that are now endemic in the region. The Karakalpaks are exposed to 43 million tons of salt and pesticide-laden dust that is whipped up by the storms that now ravage the area. Drinking water contains dangerously high levels of salt, while poverty and difficulties in accessing fresh food have led to malnutrition. The catalogue of health problems is frightening, ranging from anemia and kidney problems to cancers and respiratory problems—50 percent of all reported deaths are attributed to respiratory problems—and birth defects. Many of the diseases are attributable to Uzbekistan’s chronic overuse of agrochemicals on cotton farms. They end up in the Amu Darya river which leads to the Aral Sea basin where they enter the food chain. Studies have found significant levels of persistent organochlorines (including PCBs, dioxins and DDT) in food samples, water and even breast milk; findings that correlate with a marked rise in the incidence of immune system disorders, kidney disease, allergies, liver and reproductive problems. One recent study found that Karakalpaks suffered three and a half times the normal rate of DNA mutation and one in every 20 children is born with an abnormality, five times higher than in the West. Despite realities of government corruption, child labor and environmental degradation, the global cotton industry has done little to address the manner in which Uzbek cotton is produced. The large cotton buyers appear to operate on a “don’t know, don’t care” basis with regard to the social, economic and environmental impact of cotton farming, harvesting and distribution. In your opinion how are global cotton traders able to turn such a blind eye? The global trade in cotton is quite complicated, with cotton going through various processes and being shipped across continents before it finally arrives on the shelves of our local stores. There are only a handful of major commodities traders dealing in cotton and they are buying and selling across all the continents, never actually dealing directly with suppliers or even visiting the areas where cotton is grown. In Uzbekistan, buyers have contracts with the government export agencies, rather than with local farmers or factories, hence they are always one step removed—and if the government is able to maintain a silence over the issues of concern, then the traders are oblivious. The situation is even more complicated for the clothing manufacturers and retailers. From EJF’s dialogue with clothing companies, we have found that many simply do not know where the bulk of their cotton comes from. Some can tell us their clothes are made in, for example, Turkey, but the cotton that goes into those garments could come from one of several countries. In short, if you are a consumer, it is impossible to avoid cotton from countries such as Uzbekistan, unless you choose products that are independently certified as organic or fairly traded, or which display a label stating the country of origin of the cotton. I think consumer action can, and must, make a huge difference in sending a clear message to the Uzbek government, and to other producers who ignore the social and environmental costs of cotton production. Do you think consumers are aware such exploitation goes into making their clothing? I think the public is really in the dark as to the violations that occur in cotton production, in part because of the complexity of the supply chain. Consumers may have a grasp of the issues relating to pesticide use for instance, but the overall human cost is unknown. There have been some fantastic studies of the problems, for example, looking at child labor issues, but these reports are not necessarily generating the media interest in the West that leads to public awareness and drives concern. As cotton grown in Uzbekistan can end up in our local retail stores and shopping malls, there is such a clear connection between our shopping choices and the lives of countless millions around the globe. Ethical consumers may be sure to choose labels that are “sweatshop-free,” but the problems go so much deeper than the factory conditions. I was truly shocked when we began to research these issues—cotton marketed as a natural fiber is linked to environmental crises and human rights abuses. EJF’s reports and films have really proved successful at beginning to raise awareness of issues that quite simply were off the radar, and articles such as this are a fantastic way to spread the word and engage a new constituency in support of sustainable, ethical cotton. What can people do to help promote awareness? EJF is asking consumers to ‘pick their cotton carefully’—to refuse to buy cotton products without certain knowledge they have been produced without causing environmental destruction or human rights abuses. Consumers do have a choice—fairly traded and organic cotton clothes are becoming increasingly available, and are no longer a niche market. Large retailers and clothing manufacturers are gradually coming to see that ethical fashion does not just entail fair wages and conditions for factory laborers, but right across the production cycle—from “seed to shirt,” so to speak. Consumers can demand change and help create a massive shift in the way this commodity is produced—your purchasing power can make a real difference. To learn more visit www.ejfoundation.org.